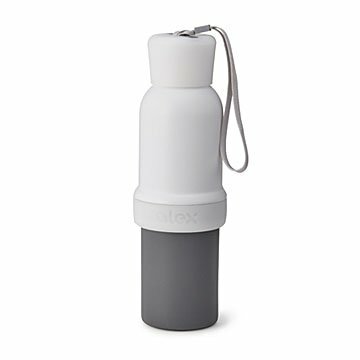 Chris Hotell's ingeniously designed steel water bottle unscrews in the middle for easy, thorough cleaning. How do you clean your water bottle? Our guess: you rinse and hope for the best, like we do. But Chris Hotell's ingeniously designed bottle is going to change that. It unscrews in the middle, not just the top, making it easy to wash by hand or in the dishwasher. After cleaning, you can see with your very own eyes that it's residue-free. Screw it back together very tightly, then go ahead and fill it with smoothies, powder drink mixes, or cocktails. It's got a removable silicone sleeve, and fits in your car cup holder or bike bottle cage. The bottom part can be used as a cup—or a cocktail shaker. (Even extra large ice cubes can fit inside.) Take it apart, and it stacks for easier storage. It's so ridiculously clever, we almost think the word "bottle" doesn't do it justice. Designed in California. Made in China. Chris Hotell was a simple man who loved his stainless steel water bottle, but a smelly residue from water and smoothies collected on the inside too quickly. When armed with dish soap and hyper-maneuverable scrub brushes, he still couldn't loosen the bacteria from the bottle. Not willing to surrender to unhealthy wasteful disposable plastic bottles, he needed something that made sustainability simple. A phone call to Mom yielded some ideas; a drinking vessel designed to open up in the middle for easy cleaning that can compact to half its size when empty. Resilient and ever thirsty, Chris grabbed his sketch pad and hacksaw. From a shower of metal filings, eraser crumbs, and graphite smudges, the Easy Clean Water Bottle was born.